CES 2015: TAD introduces TAD-CE1 Compact Evolution One bookshelf speaker | What Hi-Fi? 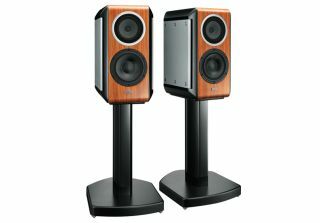 Tokyo-based manufacturer Technical Audio Devices Laboratories has announced the launch of its new TAD-CE1 Compact Evolution One bookshelf speaker, which will be on show at CES 2015. Coherent Source Transducer (CST) driver technology can be found at the heart of the TAD-CE1s, combining with a Multi-layered Aramid Composite Shell (MACS) woofer inside the new cabinet. High rigidity birch plywood, MDF, and precision-cut 10mm aluminium panels are among materials used in the construction of the cabinet, which the company says marks a "new direction in style". The CST design means the tweeter diaphragm is found concentrically in the midrange cone in an effort to deliver greater consistency in the timing and imaging from 250Hz to 100kHz. Meanwhile, the MACS woofer features a one-piece cone construction that is reinforced with multi-layered aramid composite material to help remove the weak spots that can cause distortion. Elsewhere, other features of the TAD-CE1s include the, deep breath, "Bi-Directional Aero Dynamic Slot Port system", which features slit-shaped ports in the sides of the cabinet to deliver more powerful bass.